Welcome to Brainstorming ACROSS. This is a series of articles that will cover various aspects of the problem statement of the autonomous event ACROSS and their possible solutions. This particular article will cover the Recursive Backtracker algorithm that can be used by a bot to navigate on an 8x8 grid containing obstacles at unknown locations. Note that the article does not cover on how to implement this algorithm in an autonomous robot. That will be covered in future articles. At the end you can also find the link to a software for testing grid solving algorithms. If you are a lazy reader, download the offline pdf here Brainstorming ACROSS before you begin. The objective is to go from point on the 8x8 to any other point. As an additional constraint, we consider that the arena in unknown to the bot. In other words, when the bot starts moving, it has no knowledge of the location of obstacles on the grid. It knows only its starting position and the required ending position. Let the location of bot at any point be denoted by the 2D coordinate system that is by X and Y coordinates. 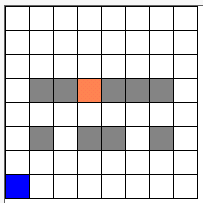 In the arena shown below, each square denotes one such point. The point (0, 0) is denoted by the top leftmost square. Base Cases: These indicate whether the current location is valid that is whether it is possible to move to it or not. They also indicate if the bot has reached the destination thereby indicating it is time to stop. Recursive Parts: These scan the four positions in the four directions around the current position to check if any of them satisfy the base cases. In programming terms this involves placing a call to the same function but with a different set of arguments, which in this case correspond to a position. 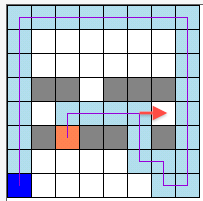 Hence this part is termed as recursive and it is responsible for the robot advancing through the maze. Let’s start by assuming there is already some algorithm that finds a path from some point in a maze to the goal and call it RecurPath (x, y). Note that these checks can be performed in any order. Now since going west will mean going out of the grid, that function call should return something to indicate the same. While rest of the directions are valid and the function should indicate the same. Generalizing this, we can call RecurPath () recursively to move from any location in the maze to adjacent locations. In this way, we move through the maze. It’s not enough to recursively advance through the maze. We also need to determine when to stop. One such base case is to stop when it reaches the goal. Is the position in the maze (…or did we just go outside its bounds)? Is the position open (…or is it blocked with an obstacle)? Marking x,y as visited is necessary to prevent the bot from going around in circles. For the explanation to the last call to _Move robot to (x,y) _see the Dead Ends section of this post. Locate the start position (call it startx, starty). Since none of the base cases are satisfied, code reaches the highlighted step, placing a call to _RecurPath (0, 0). _Note that the call has not yet finished executing. Thus the robot moves to (0, 0). Reaches the code highlighted in Red, placing a call to RecurPath(0, -1). _This will return false since the point is outside the maze. So the code proceeds to the next step, calling _RecurPath(1, 1). 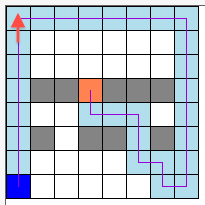 _Thus the robot moves to (1, 1) and in this manner the sequence keeps going on. The sequence will end only when the robot reaches the goal, that function call will then return true and subsequently all the calls before it _will return true as well. Thus the output of our initial call to _RecurPath(startx, starty) _will be true. 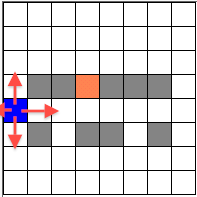 Again the code reaches Move robot (5,4) moving the bot from (6,4). In this way the bot backtracks on reaching a dead end. Software that demonstrates the above algorithm can be found here MinotaurPathfinder Extract the zip file. You can find more information on how to use in the Readme file contained within. For a source code of the software, written in C# (using Visual Studio 2012), click MinotaurPathfinder_Source. Note that the software only marks the final valid path. The robot might have to move to additional squares and backtracked on finding a dead end. In future articles we will look at more algorithms, ways to a map a grid, how to implement the recursive backtracker in a bot and much more. Stay tuned for more. You can also try to optimize the algorithm according to the A.C.R.O.S.S arena. 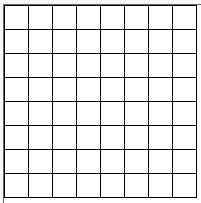 One way can be by prioritizing which direction is checked first at each square. Remember that a juicy cash prize is waiting for the bot with the Best Algorithm in ACROSS in addition to the top prizes. May the best algorithm win ! !